From earnest bachelorettes to moms out for an overdue girl’s night out to corporate executives bringing together their staff for a team-building event, this is the number one question I’m asked at my Conscious Crumbs cooking parties. When I do in-home, private lessons I emphasize doing what you can with what you have, intent on cultivating culinary MacGyvers rather than filling cabinets with unnecessary equipment. Still, they press me for what to buy or register for. Now I keep a kitchen essentials list on Amazon, but I share it cautiously, reminding eager cooks and bakers that they don’t need everything on the list to enjoy time in their kitchens and prepare satisfying dishes. For me cooking is more than the utensils, gadgets, and appliances that overload my cupboards and drawers. (Even though I shudder at the thought of slicing five pounds of cucumbers for a crudités platter without my mandoline.) Time in my kitchen is a crisp Albarino wine to sip from a delicate stemmed glass while I mince garlic. It’s a white pillar candle (unscented, please) casting a warm glow in the evening over my prep area. Tonight it’s shaking my hips to Gary Clark Jr. while I stir a burbling pot of mushroom risotto. Tomorrow Lynne Rossetto Kasper’s guest chefs on The Splendid Table will transport me to the bustling streets of Thailand in one segment, then instruct me on the finer points of massaging kale in the next. Cooking is waiting for a text from Greg letting me know that he’s on his way home. It’s a brand new, ice-cold cookbook rescued from our snow-covered porch. Or Penny De Los Santos‘s latest pics on Instagram. It’s the bell that chimes from my trusty toaster oven where fragrant hazelnuts are toasting. White plates are warming on top, a blank canvas ready to be dressed with my latest culinary experiment. Thoughtfully arranged plates will soon sit next to mismatched, unpolished antique silverware collected from local thrift shops. Each fork and knife tells a different story, their settings ranging from British passenger liners to 19th century luxury hotel dining rooms. It’s dimming the lights, always too low for Greg who claims that I was a mole in a previous life. His wine glass joins mine at our small table where we’ll linger as long as time allows. Then it’s time for a little hip-hop while we scour pans and fire up the dishwasher. These are my real kitchen essentials, because they allow me to feed the ones I love and feed my soul. Cashews, curry, and coconut. It just might be my favorite flavor combination–in sweets and in savories. Speaking of the sweet variety, my food blogger friend at saltandserenity.com makes a delicious coconut curry cashew that’s reminiscent of a nut brittle. They are equally addictive. In a medium bowl, beat the egg white with a small whisk until foamy. Whisk in salt, spices, sugar, and coconut. Stir in the nuts. Spread the nuts in a single layer on the baking sheet. Bake for 15 minutes. Stir. Return to the oven and bake until golden, about 15-20 minutes. Not a fan of cashews? Try these recipes for roasted almonds: Rosemary Almonds or Smoky Sriracha Almonds. Those sound delicious, my favorite nut, too! I wonder how they ship! 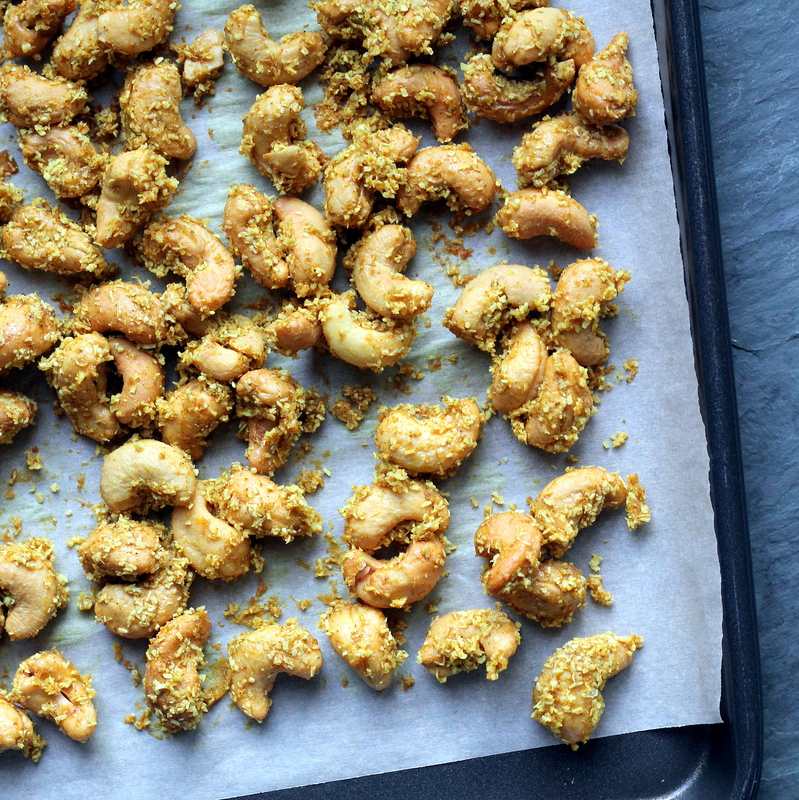 Your roasted coconut curry cashews look almost exactly like the ones I forced myself to walk away from at Trader Joes last month. (That is to say they look unbelievably addictive and delicious!) I think I would like your cashew recipe even better than the ones I made, although I do not have the willpower to tempt myself. My kitchen must haves include my Santoku knife, parchment paper (I order 1000 sheets at a time! ), and my beloved Kitchen Aid Mixer. Fantastic photo by the way! Those cashews are jumping off my screen!!! !